It has recently become an article of faith that workers in advanced industrial nations are experiencing almost unprecedented levels of labor-market disruption and insecurity. From taxi drivers being displaced by Uber, to lawyers losing their jobs to artificial intelligence-enabled legal-document review, to robotic automation putting blue-collar manufacturing workers on unemployment, popular opinion is that technology is driving a relentless pace of Schumpeterian “creative destruction,” and we are consequently witnessing an unprecedented level of labor market “churn.” One Silicon Valley gadfly now even predicts that technology will eliminate 80 to 90 percent of U.S. jobs in the next 10 to 15 years. As the Information Technology and Innovation Foundation has documented, such grim assessments are the products of faulty logic and erroneous empirical analysis, making them simply irrelevant to the current policy debate. (See: “Robots, Automation, and Jobs: A Primer for Policymakers.”) For example, pessimists often assume that robots can do most jobs, when in fact they can’t, or that once a job is lost there are no second-order job-creating effects from increased productivity and spending. But the pessimists’ grim assessments also suffer from being ahistorical. When we actually examine the last 165 years of American history, statistics show that the U.S. labor market is not experiencing particularly high levels of job churn (defined as new occupations being created while older occupations are destroyed). In fact, it’s the exact opposite: Levels of occupational churn in the United States are now at historic lows. The levels of churn in the last 20 years—a period of the dot-com crash, the financial crisis of 2007 to 2008, the subsequent Great Recession, and the emergence of new technologies that are purported to be more powerfully disruptive than anything in the past—have been just 38 percent of the levels from 1950 to 2000, and 42 percent of the levels from 1850 to 2000. Other than being of historical interest, why does this matter? Because if opinion leaders continue to argue that we are in unchartered economic territory and warn that just about anyone’s occupation can be thrown on the scrap heap of history, then the public is likely to sour on technological progress, and society will become overly risk averse, seeking tranquility over churn, the status quo over further innovation. Such concerns are not theoretical: Some jurisdictions ban ride-sharing apps such as Uber because they fear losing taxi jobs, and someone as prominent and respected as Bill Gates has proposed taxing robots like human workers—without the notion being roundly rejected as a terrible idea, akin to taxing tractors in the 1920s. In fact, the single biggest economic challenge facing advanced economies today is not too much labor market churn, but too little, and thus too little productivity growth. Increasing productivity is the only way to improve living standards—yet productivity in the last decade has advanced at the slowest rate in 60 years. This report reviews U.S. occupational trends from 1850 to 2015, drawing on Census data compiled by the University of Minnesota’s demographic research program, the Minnesota Population Center, to compare the changes in occupational job levels from decade to decade. We also assign a code to each occupation to judge whether increases or decreases in employment in a given decade were likely due to technological progress or other factors. Overall, three main findings emerge from this analysis. First, contrary to popular perception, rather than increasing over time, the rate of occupational churn in recent decades is at the lowest level in American history—at least as far back as 1850. Occupational churn peaked at over 50 percent in the two decades from 1850 to 1870 (meaning the absolute value sum of jobs in occupations growing and occupations declining was greater than half of total employment at the beginning of the decade), and it fell to its lowest levels in the last 15 years—to around just 10 percent. When looking only at absolute job losses in occupations, again the last 15 years have been comparatively tranquil, with just 70 percent as many losses as in the first half of the 20th century, and a bit more than half as many as in the 1960s, 1970s, and 1990s. Second, many believe that if innovation only accelerates even more then new jobs in new industries and occupations will make up for any technology-created losses. But the truth is that growth in already existing occupations is what more than makes up the difference. 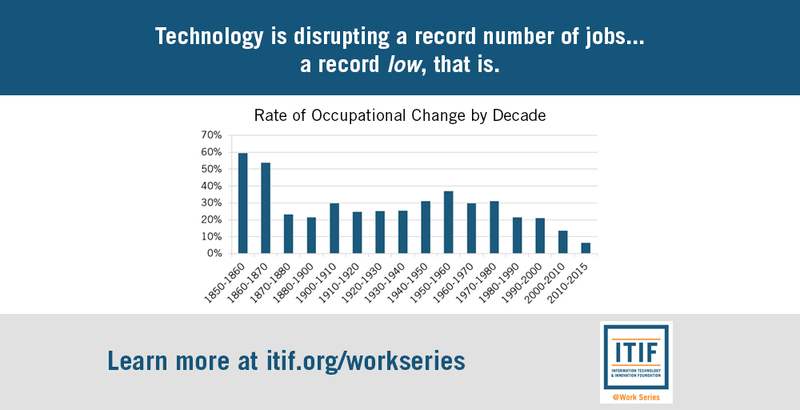 In no decade has technology directly created more jobs than it has eliminated. Yet, throughout most of the period from 1850 to present, the U.S. economy as a whole has created jobs at a robust rate, and unemployment has been low. This is because most job creation that is not explained by population growth has stemmed from productivity-driven increases in purchasing power for consumers and businesses. Such innovation allows workers and firms to produce more, so wages go up and prices go down, which increases spending, which in turn creates more jobs in new occupations, though more so in existing occupations (from cashiers to nurses and doctors). There is simply no reason to believe that this dynamic will change in the future for the simple reason that consumer wants are far from satisfied. 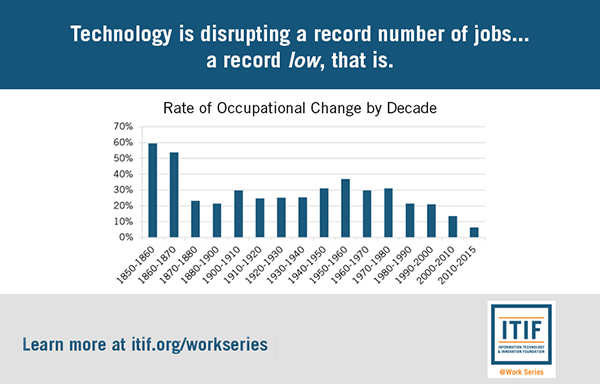 Third, in contrast to the popular view that technology today is destroying more jobs than ever, our findings suggest that is not the case. The period from 2010 to 2015 saw approximately 6 technology-related jobs created for every 10 lost, which was the highest ratio—meaning lowest share of jobs lost to technology—of any period since 1950 to 1960. Many believers in the inaccurately named so-called “fourth industrial revolution” will argue that this relative tranquility is just the calm before a coming storm of robot- and artificial-intelligence-driven job destruction. But projections based on this view—including from such venerable sources as the World Economic Forum and Oxford University—are either immaterial or inaccurate. Take a deep breath, and calm down. Labor market disruption is not abnormally high; it’s at an all-time low, and predictions that human labor is just one tech “unicorn” away from redundancy are likely vastly overstated, as they always have been. If there is any risk for the future, it is that technological change and resulting productivity growth will be too slow, not too fast. Therefore, rather than try to slow down change, policymakers should do everything possible to speed up the rate of creative destruction. Otherwise, it will be impossible to raise living standards faster than the current snail’s pace of progress. Among other things, this means not giving in to incumbent interests (of companies or workers) who want to resist disruption. Policymakers should do more to improve labor-market transitions for workers who lose their jobs. That is true regardless of the rate of churn or whether policy seeks to retard or accelerate it. Likewise, it doesn’t matter whether the losses stem from short-term business-cycle downturns or from trends that lead to natural labor-market churn. 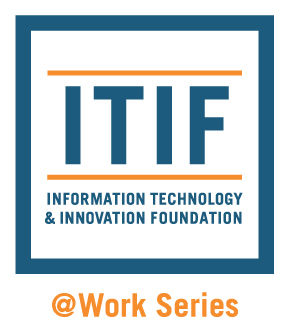 While this report lays out a few broad proposals, a forthcoming ITIF report will lay out a detailed and actionable policy agenda to help workers better adjust to labor-market churn.